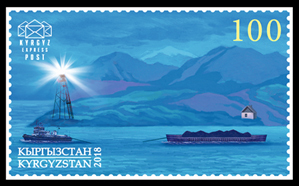 ..:: The postage stamps of Kyrgyzstan 2018 ::..
992. 55.00 Dog - symbol of 2018, the year of a kind and faithful Yellow Dog. 993. 76.00 Dog - symbol of 2018, the year of a kind and faithful Yellow Dog. The State Committee of Information Technologies and Communications of Kyrgyz Republic, according to the order No. 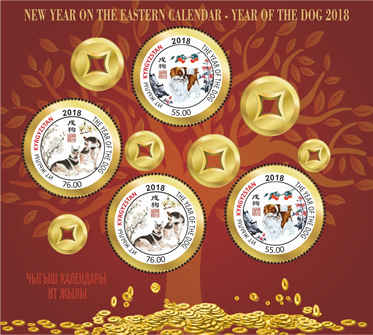 6-pr, dated 23 January 2018, introduced a postage stamp on «New Year on the Eastern calendar - Year of the Dog» theme. Postage stamps were printed on sheets in the form of sheetlets with 4 postage stamps on each (2 stamps of each series). Sheet size is 150x135 mm; stamp size is d=40 mm. Circular perforation. Offset printing, full-color with UV protection elements. Coated and gummed paper. Edition was printed by Bobruisk Integrated Printing House named after A.T. Nepogodin, Belarus. The State Committee of Information Technologies and Communications of Kyrgyz Republic, according to the order No. 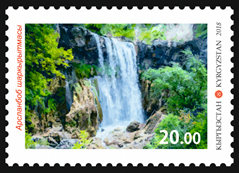 7-pr, dated 26 January 2018, introduced a postage stamp on «Happy New Year» theme. Postage stamp was printed on reduced format sheets with 4 stamps and 1 coupon on each. Sheet size is 134x100 mm; stamp size is 34х34 mm. Offset, full-colored printing, coated and gummed paper. Stamp was printed by "NOVA-IMPRIM" SRL printing house, Moldova. 994. 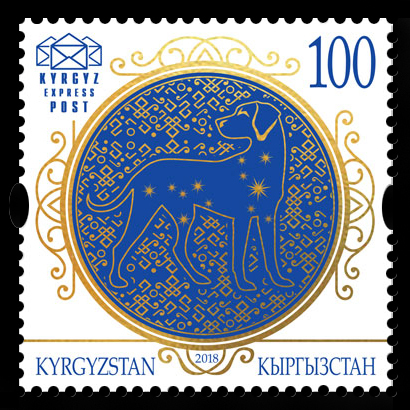 100.00 Yellow Earth Dog - symbol of the New Year. Sheet size is 113x68 mm, stamp size is 46x27.5 mm. Offset printing, coated and gummed paper. Souvenir sheet was printed by "NOVA-IMPRIM" SRL printing house, Moldova. The State Committee of Information Technologies and Communications of Kyrgyz Republic, according to the order No. 47-pr, dated 14 March 2018, introduced a postage stamp on “Alysh” - Kyrgyz national belt wrestling, 1 stamp theme. Postage stamp was printed on reduced format sheets with 6(2х3) postage stamps on each. Sheet size is 100x100 mm; stamp size is 28x40-mm. Offset printing, full-color with UV protection elements. Coated and gummed paper. 1001. 76.00 “Alysh” - Kyrgyz national belt wrestling . The State Committee of Information Technologies and Communications of Kyrgyz Republic, according to the order No. 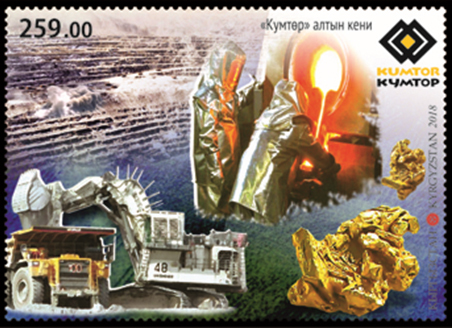 56-a, dated 02 April 2018, introduced a postage stamps on “25th Anniversary of the national currency of the Kyrgyz Republic, souvenir sheet of 1 stamp” theme. 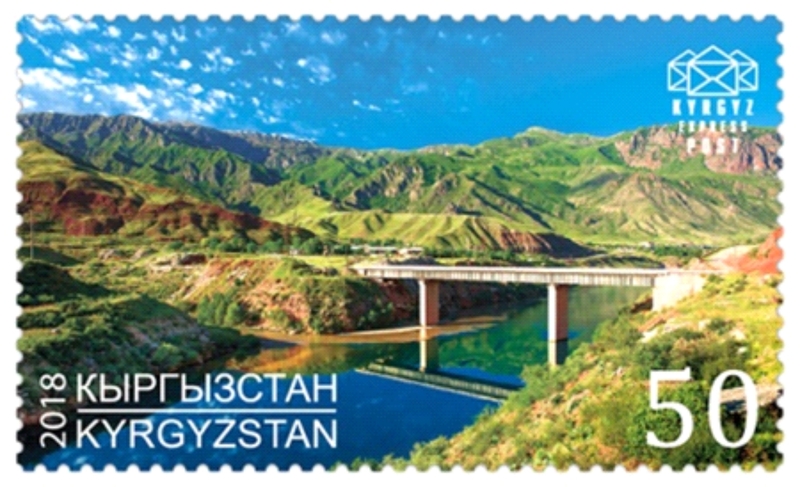 A postage stamp was printed on souvenir sheet with decorated fields. Sheet size is 126x68 mm, stamp size is 37x52mm. Offset printing, full-color with UV protection elements. Coated and gummed paper. Souvenir sheet was printed by Bobruisk Integrated Printing House named after A.T. Nepogodin, Belarus. The State Committee of Information Technologies and Communications of Kyrgyz Republic, according to the order No. 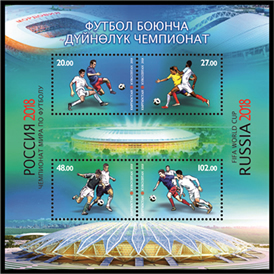 75-a, dated 25 April 2018, introduced a series of postage stamps on "XXI FIFA World Cup, Russia, series of 4 stamps " theme. Stamps were printed on reduced format sheets with 6 (2х3) stamps on each. Sheet size is 100x100 mm, stamp size is 40x28 mm. Offset printing, full-color with UV protection elements. Coated and gummed paper. 1005. 48.00 Fight for the ball. The State Committee of Information Technologies and Communications of Kyrgyz Republic, according to the order No. 86-a, dated 02 May 2018, introduced a postage stamp on “200th Birth Anniversary of Karl Marx, 1 stamp” theme. Stamp was printed on reduced format sheets with 5 stamps + 1 coupon on each. Sheet size is 113x108 mm; stamp size is 46x27.5 mm. Offset printing, coated and gummed paper. 1007. 200th Birth Anniversary of Karl Marx, 1 stamp (1818- 2018). 1008. 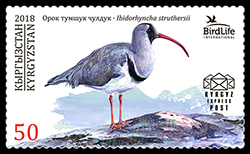 50.00 Ibis-bill (Ibidorhyncha struthersil). 1009. 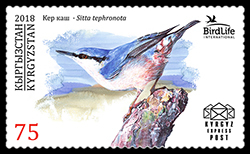 75.00 Big rock nuthatch (Sitta tephronota). 1011. 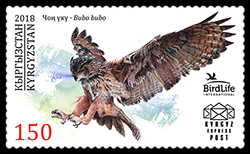 150.00 Eagle owl (Bubo bubo). The State Committee of Information Technologies and Communications of Kyrgyz Republic, according to the order No. 129-a, dated 12 Junel 2018, introduced a postage stamp on “Heroes of the Kyrgyz Republic. Zhusup Mamay.” theme, 1 stamp. A postage stamp was printed on reduced format sheets with 6 (2х3) stamps on each. Sheet size is 100x100mm, stamp size is 40x28mm. Offset printing, full-color with UV protection elements. Coated and gummed paper. 1013. 50.00 Automobile bridge, Kara-Kul town. 1014. 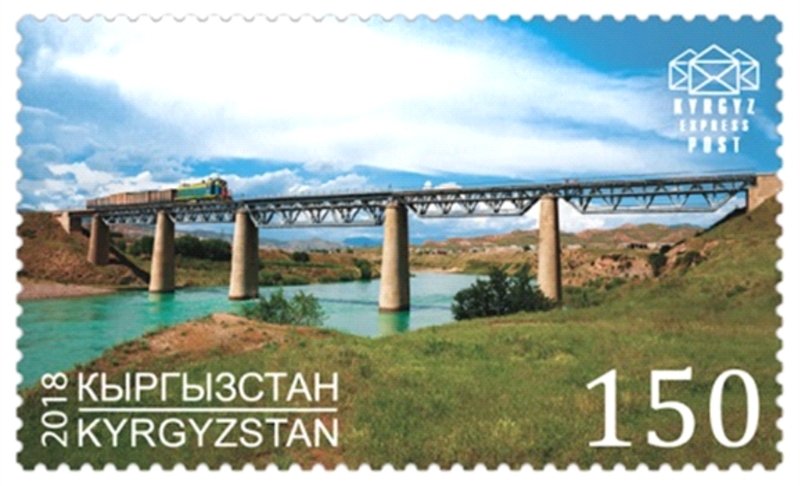 150.00 Railway bridge, Kuduk village, Jalal-Abad region. The State Committee of Information Technologies and Communications of Kyrgyz Republic, according to the order No. 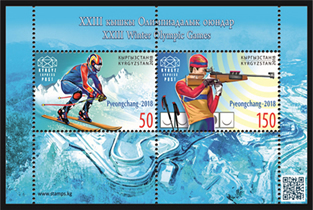 138-а, dated 18 June 2018, introduced a series of postage stamps on “XVIII Asian Games, series of 2 postage stamps” theme. Stamps were printed on reduced format sheets with 4 stamps and 2 coupons on each. Sheet size is 113x108 mm; stamp size is 46x27.5 mm. Offset printing, coated and gummed paper. Stamp was printed by "NOVA-IMPRIM" SRL printing house, Moldova. 1015. 100.00 Canoeing, swimming, yacht racing. 1016. 150.00 Golf, taekwondo, volleyball. 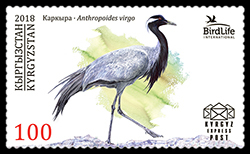 The State Committee of Information Technologies and Communications of Kyrgyz Republic, according to the order No.172-а, dated 19 July 2018, introduced a series of postage stamps on " Fauna of Kyrgyzstan. Bugs, series of 4 postage stamps" theme. Stamps were printed on reduced format sheets with 6 (2х3) stamps on each. Sheet size is 100x100 mm, stamp size is 40x28 mm. Offset printing, coated and gummed paper. Edition was printed by Belarusian Printing House, Minsk. The State Committee of Information Technologies and Communications of Kyrgyz Republic, according to the order No. 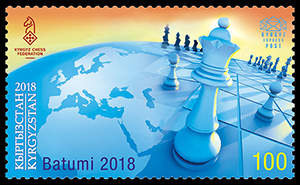 204-а, dated 14 August 2018, introduced a postage stamp on “The 43rd Chess Olympiad in Batumi, 1stamp” theme. Postage stamp was printed on reduced format sheets with 4 stamps and 2 coupons on each. Sheet size is 113x108 mm; stamp size is 46x27.5 mm. Offset printing, coated and gummed paper. Stamp was printed by "NOVA-IMPRIM" SRL printing house, Moldova. 1021. 100.00 Chessboard and figures on the globe background, as well as the logo of the Chess Federation of the Kyrgyz Republic. Date: 25.08.2018, sheet of 1 stamp. 1022. 117.00 On the stamp: image with heads of delegations of ITU state-founders which was created on 17 May 1865 and PP-18 logo. Date: 07.09.2018. series of 3 stamps. 1023. 50.00 Parnassius loxias tashkorensis. 1026. 76.00 Surma-Tash State Reserve. 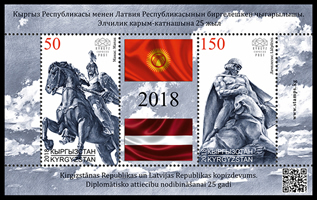 Joint stamp issue between the Kyrgyz Republic and the Republic of Latvia. Date: 05.10.2018, sheet of 2 stamps. 1027. 50.00 Monument of Manas in Bishkek, Kyrgyzstan. 1028. 150.00 Monument of Lachplesis in Riga, Latvia. Date: 13.10.2018. series of 4 stamps. 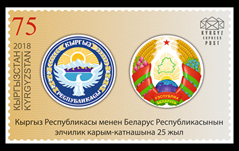 Joint stamp issue between the Kyrgyz Republic and the Republic of Belarus.25th anniversary of diplomatic relations. The State Committee of Information Technologies and Communications of Kyrgyz Republic, according to the order No. 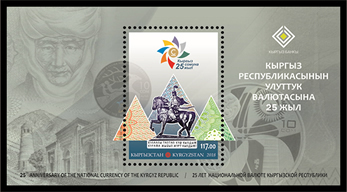 260-а, dated 12 October 2018, introduced a series of postage stamps on “The 25th anniversary of the establishment of diplomatic relations between the Kyrgyz Republic and the Republic of Belarus” theme, 1 stamp. 1033. 75. 00 State Emblems of the Kyrgyz Republic and the Republic of Belarus. 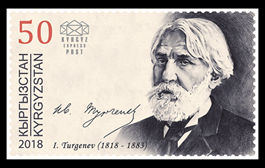 The 200th anniversary of the birth of Ivan Turgenev. 1034. 50. 00 Portrait of Ivan Turgenev (1818 - 1883). 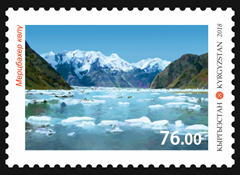 Date: 16.11.2018. series of 2 stamps. The State Committee of Information Technologies and Communications of Kyrgyz Republic, according to the order No. 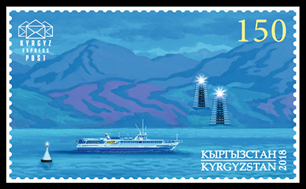 289-а, dated 01 November 2018, introduced a series of postage stamps on “Issyk-Kul Lighthouses” theme, series of 2 stamps. 1036. 150.00 Folding signs, buoy and motor ship. Date: 17.11.2018. series of 2 stamps. The State Committee of Information Technologies and Communications of Kyrgyz Republic, according to the order No. 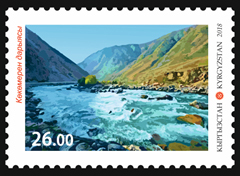 294-а, dated 14 November 2018, introduced a series of postage stamps on “Nature of Kyrgyzstan” theme, series of 4 stamps. Postage stamps were printed on reduced format sheets with 6 (2x3) stamps on each. Sheet size is 100x100 mm; stamp size is 40x28 mm. Offset printing, coated and gummed paper. Stamp was printed by Belarusian Printing House, Minsk. 1037. 20.00 Arslanbob small waterfall. 1040. 83.00 Alpine meadows of Ala-Archa pass. 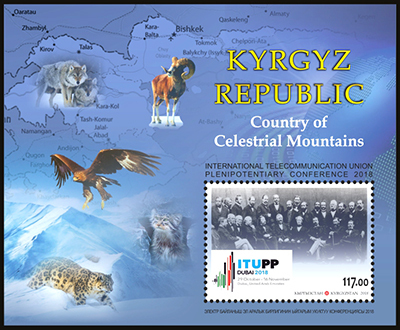 Joint stamp issue between the Kyrgyz Republic and the Republic of Malta. Date: 23.11.2018. series of 2 stamps. The Red Book of Kyrgyzstan, animals. 1044. 75.00 Pallas's cat (Otocolobus manul) - feline mammal. 1045. 100.00 Turkestan lynx (Lynx lynx isabellinus) - rare subspecies of Eurasian lynx. 1046. 150.00 Himalayan brown bear (Ursus arctos sabellinus)-Rarest subspecies of the brown bear. Date: 08.12.2018, souvenir sheet of 1 stamp. 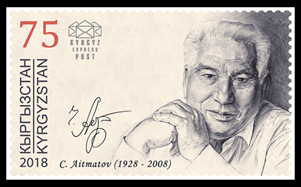 90th anniversary of the birth of Ch.Aitmatov. Rukh Ordo cultural center n.a.Ch.Aitmatov. Date: 10.12.2018, souvenir sheet of 1 stamp. The State Committee of Information Technologies and Communications of Kyrgyz Republic, according to the order No. 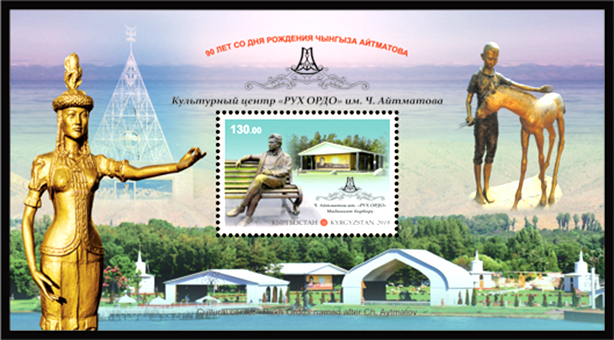 311-a, dated 05 December 2018, introduced a postage stamp on “Rukh Ordo cultural center n.a.Ch.Aitmatov” located in Cholpon Ata” theme souvenir sheet of 1 stamp. 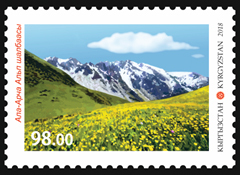 A postage stamp was printed on souvenir sheet with decorated fields Souvenir sheet size is 130x70 mm, stamp size is 40x28 mm. Offset printing, full-color with UV protection elements. Coated and gummed paper. 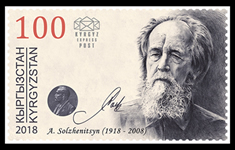 100th anniversary of the birth of Aleksandr Solzhenitsyn.